Seventy airmen and soldiers went to work at Joint Base Elmendorf-Richardson, Alaska, last week acting out of character — late to duty, withdrawn — and appearing injured — black eyes, bruised faces. Then they waited to see what would happen. It was part of a social experiment devised by the Army and Air Force Family Advocacy offices at Elmendorf for Domestic Violence Awareness Month. What they wanted to know: Would their colleagues intervene or look the other way? And if they looked the other way, why? 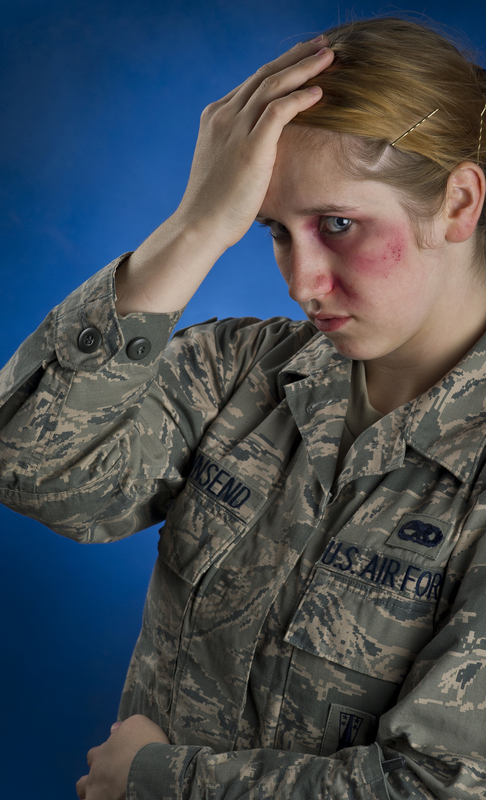 Diann Richardson, outreach manager for Air Force Family Advocacy at Elmendorf, said she and her colleagues had wondered whether their usual way of trying to raise awareness about domestic violence — setting up booths and handing out information — was really effective, according to an Air Force story by Tech. Sgt. Vernon Cunningham. “Well, people walk past our live event … and say ‘thanks’ or walk the other way,” Richardson said. The booths weren’t working the way they’d hoped. So they decided to try something different. Family Advocacy asked for volunteers to receive mock injuries and got the help of base leadership and the Pacific Air Forces Air Force Medical Modeling and Simulation Training team. They also informed military police dispatch and the base hospital in case a flood of calls came in. On Oct. 22 and 23, the “victims” showed up late or missed formation. One of them was Col. Reba Harris, a squadron commander, who arrived late to a meeting with a black eye. One non-commissioned officer asked to speak with her in private in the restroom and asked if she was OK and needed any help, the story said. Airman 1st Class Nicholas Key, another participant, said most people said something to him — but jokingly. Key said he actually felt embarrassed by the “wound” on his face. He took it personally when people noticed the injury but didn’t say anything. One person who approached Key to ask if he was OK said he almost didn’t because he worried Key would get upset. Key said he saw a female airman with an even more pronounced “injury” — what looked like a cut — in line at a dining facility. No one said anything to her, according to the story. Richardson said people seemed more comfortable approaching a man with an injury than a woman. But when Army Private 1st Class Talia Pitts went to work late with what appeared to be bruises on her face, her sergeants reacted right away, telling their first sergeant who called the military police, the story said. “They did everything right. They were all very concerned,” Pitts said. It was different outside her unit, however. Family Advocacy wanted to know where they stand when it comes to domestic violence, the story said. Richardson said she next wants to find out why people didn’t ask. “If you suspect it, you need to report it” — regardless of who it is.